The year was 1961. I was fourteen years old, the only child of blue-collar workers living in Peoria, Illinois. Lacking any great understanding of the winds of change that were blowing through our nation and the world, I sat transfixed in front of our small black-and-white television as John F. Kennedy delivered his inaugural address as the nation’s 35th president. The sound might have crackled and the picture wavered, but Kennedy’s message came through loud and clear. It was a message of hope, challenge and faith to an America that could be a beacon of freedom to the rest of the world. I realized that Kennedy was not talking to my parents or my teachers or the cop on the beat: he was talking to me. Everything in me wanted to be part of an America that was a champion of justice and a model of virtue. I longed to be part of making that dream a reality. It was a pivotal moment in my life, one that eventually led to my career in constitutional law. When Kennedy called on Americans to “bear the burden of a long twilight struggle” to defend freedom in its hour of maximum danger, I never would have guessed how long that twilight would last–or that half a century later, we, the American people, would come to represent the gravest threat to our freedoms through our apathy, ignorance and indifference. The world is a very different place from when I was a teenager. We undeniably live in perilous, uncertain times. Our nation is plagued by perpetual war; a deteriorating economy; shadowy enemies bent on terrorizing us; increasingly aggressive government agencies. Governmental tentacles now invade virtually every facet of our lives, with agents of the government listening in on our telephone calls and reading our emails. Technology, which has developed at a rapid pace, offers those in power more invasive, awesome tools than ever before. The groundwork has been laid for a new kind of government where it will no longer matter if you’re innocent or guilty, whether you’re a threat to the nation or even if you’re a citizen. What will matter is what the president–or whoever happens to be in power at the time–thinks. We have an appalling literacy rate; a populace with little understanding of history or the United States Constitution; porous borders with countless illegal immigrants flowing over them; ravaging natural disasters; a monstrous financial deficit; armed forces pushed to their limit, spread around the globe. We’re embroiled in endless wars against rebel enemies that seem to attack from nowhere. Our country is both ideologically and politically fractured. America’s credibility around the world is at an all-time low. And I am not alone in believing that we may be only one terrorist attack away from becoming a military state. Our very freedoms are at stake. Is there any hope? Yes, there is. But that hope does not rest with a president, Congress or the government. And it never has. That is an illusion. As I point out in my book, A Government of Wolves: The Emerging American Police State, the only real hope in any significant change for the better rests in the American people. But first we have to regain a sense of America’s history and reclaim our inheritance. The freedoms we often take for granted did not come about through happenstance. They were hard-won through the sheer determination, suffering and sacrifice of thousands of patriotic Americans who not only believed in the cause of liberty but also acted on that belief. The success of the American Revolution owes much to these men and women. In standing up to the British Empire and speaking out against an oppressive regime, they exemplified courage in the face of what must have seemed like an overwhelming foe. Those revolutionaries were average citizens, not agitators or hotheads. They were not looking for trouble or trying to start a fight. Like many today, they were simply trying to make it from one day to another. But they finally had enough and decided to stand and fight for the one thing that makes an American an American: freedom. Still looking for that perfect gift for that special somebody? 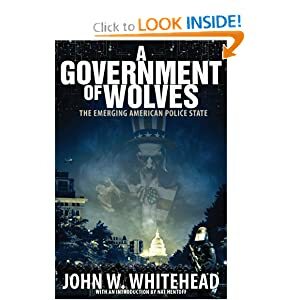 A Government of Wolves: The Emerging American Police State is available for a special holiday price of $15.95. It wasn’t easy. Many lost their livelihoods and homes. Many lost their lives. But, like Tom Paine, they would not be sunshine patriots. They would not shrink from service to their country. Why stay we here idle? What is it that gentlemen wish? What would they have? Is life so dear, or peace so sweet, as to be purchased at the price of chains and slavery? Forbid it, Almighty God. I know not what course others may take, but as for me: give me liberty, or give me death!